Dimensions : Length : 11 Inch ; Width : 11 Inch; Height : 0.8 Inch. CONVENIENT AND STRONG AND DURABLE - Easy to use and easy to clean. super strong, and dishwasher safe. curved lip there are no sharp edges, Stainless steel is rustproof, weather is no problem, Stainless steel is durable and elegant for the outdoor table, 304 stainless steel has the best corrosion and durability. This is the same grade of stainless steel that is used in high end kitchenware. 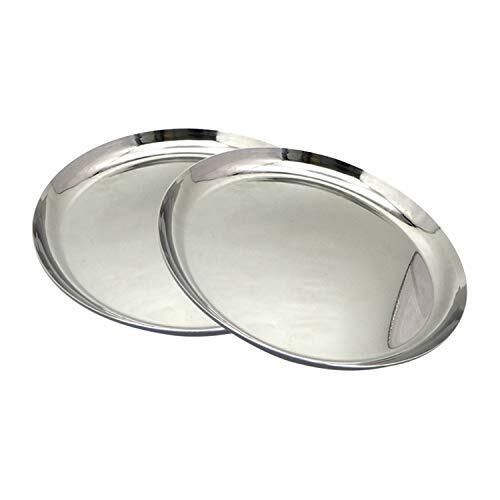 VERSATILE STAINLESS STEEL ROUND PLATE - Great for indoor and outdoor use, easy transportation, stackable and storage - Dinner, Camping, Barbecues, Picnics, Traveling, Outdoor Events. If you have any questions about this product by Bignay, contact us by completing and submitting the form below. If you are looking for a specif part number, please include it with your message. By Unica Household Products, Inc.